This luxurious neck piece, designed as a wide scarf with a ruffled header, may be worn a wide variety of ways and might be one of the most versatile accessories in your wardrobe. 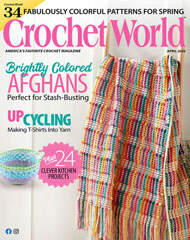 This e-pattern was originally published in the Autumn 2011 issue of Crochet! magazine. Size: 7" x 50". Made with medium (worsted) weight yarn and size H (5mm) hook.